I have recently been involved with the creation of The Heritage Way which I am pleased to say is now complete and has its public opening later this month. Below is information on the route and also the Official Opening on May 31st. I have also attached a magazine article about the route! 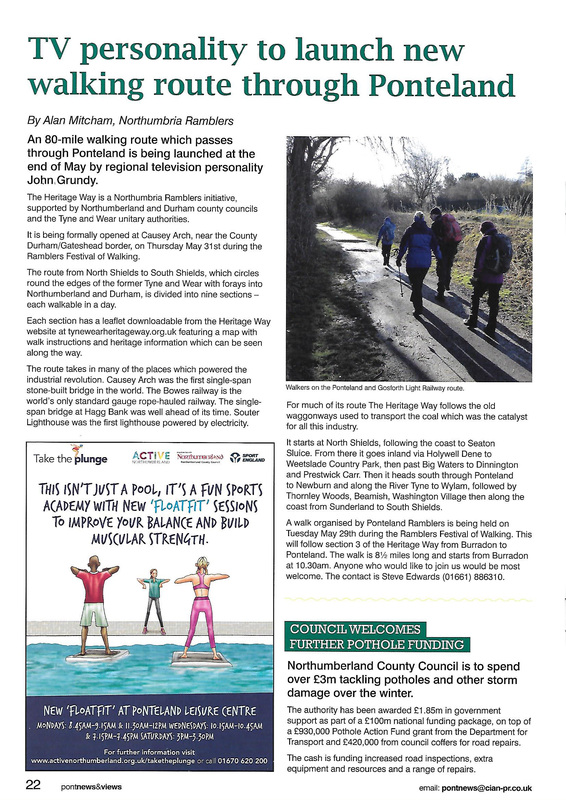 The Heritage Way is a Northumbria Ramblers initiative, supported by Northumberland and Durham County Councils and the five local authorities which constituted the former Tyne and Wear Metropolitan District. It is being formally opened at Causey Arch by TV personality John Grundy on Thursday 31st May during the Ramblers Festival of Walking. It is an 80-mile walking route which travels around the edges of the former Tyne and Wear with forays into Northumberland and Durham. It is divided into 9 sections (all walkable in a day). The route passes through pleasant countryside, taking in woodland, coastal and riverside scenery, whilst visiting many places associated with the rich industrial heritage of the northeast. The route is described in 9 leaflets, all downloadable from the Heritage Way website www.TyneWearHeritageWay.org.uk. Each leaflet features a map with walk instructions and heritage information which can be seen along the way. The Heritage Way takes in many places that powered the industrial revolution. Causey Arch was the first single-span stone-built railway bridge in the world. The Bowes Railway is the world’s only standard gauge rope-hauled railway. The single-span arch bridge at Hagg Bank was well ahead of its time. Souter Lighthouse was the first lighthouse powered by electricity. The Heritage Way takes in all of these sites and many more. For much of its route it travels along the old waggonways used to transport the coal which was the catalyst for all this industry. The northern half of the Heritage Way starts at North Shields and follows the coast to Seaton Sluice. From there it goes inland via the scenic Holywell Dene to Weetslade Country Park, then past Big Waters to Dinnington and Prestwick Carr. Then it heads south through Ponteland to Newburn and along the River Tyne to Wylam. The southern half goes from Wylam to Thornley Woodland (where for a short section it follows the Red Kite Trail), then past Causey Arch to Beamish and Washington Village. The final two sections follow the River Wear to Roker Pier and along the coast and the Cleadon Hills to South Shields. All of this is very pleasant walking. The black and white Heritage Way markers are already in place. They are easy to spot and feature a coal wagon of the type used on the waggonways which are a significant part of the route. Route marking, website development and leaflet design has been done by Northumbria Ramblers with the support of the local authorities. The Heritage Way will be officially opened by John Grundy at 2.30pm on 31st May at Causey Arch in County Durham. Causey Arch is on the route of the Heritage Way. There will be TV and press coverage. Ramblers groups will converge at Causey Arch in time for the opening. Teas will be available at the Causey Arch Café (next to the carpark) for invited guests. A locomotive will be in steam on the adjacent Tanfield Railway and local folk duo will be playing and singing on scene. The entirety of the Heritage Way will be walked in the week from 25 May to 3 June coinciding with the Ramblers Festival of Walks. The various sections will be led by the various Ramblers Groups in the area. Anyone interested in joining the walks over this week, please contact your local Ramblers Group. This entry was posted on Tuesday, May 22nd, 2018 at 12:13 am	and is filed under Other.